It doesn't matter if your dog eats your homework, or if you eat your teacher, you still have to go to class! That's what we were always told when we were growing up, and it still applies today. At least these days, even brain-chomping zombies can look cool when they have to go to school, and your kid can look just like one of them in this creepy Zombie School Girl Costume! 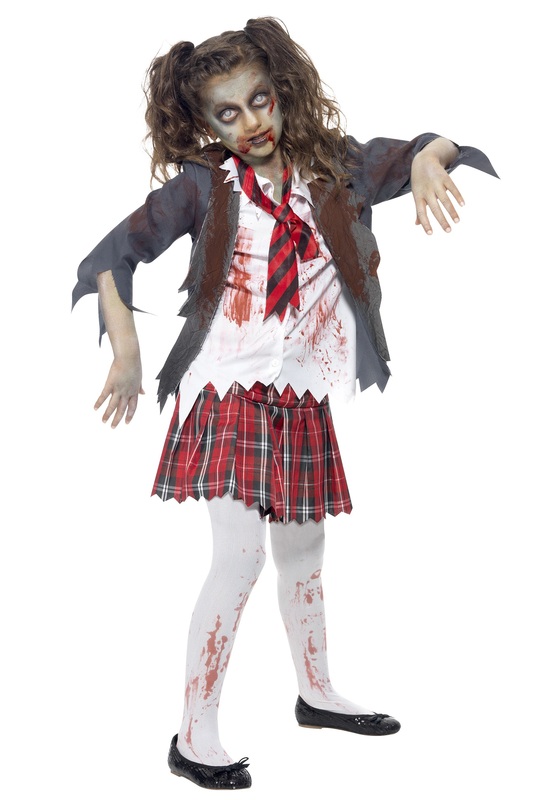 Going to school with zombies is tough, but we can't even imagine how the zombies feel about it. How can a shambling ghoul be expected to carry their books around with their arms stiffly stretched out all the time? Nobody wants to sit with them at lunch, either, because the non-zombified kiddos always get sick once they see what undead students have in their lunchboxes (we'll give you a hint: it ain't carrot sticks and PB&Js). And who could forget gym class, which is clearly made for students with functioning circulatory systems, and the coaches always hate it when zombies try to eat other players during dodgeball games. Isn't school already scary enough?!? 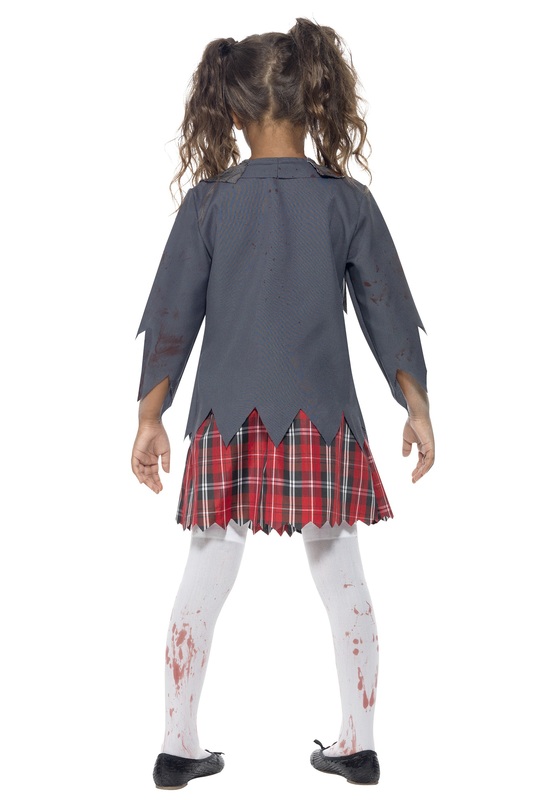 Luckily, your kid is just dressing like a reanimated school girl in this costume, so she can have fun creeping out her friends, rather than resisting the urge to eat their brains. 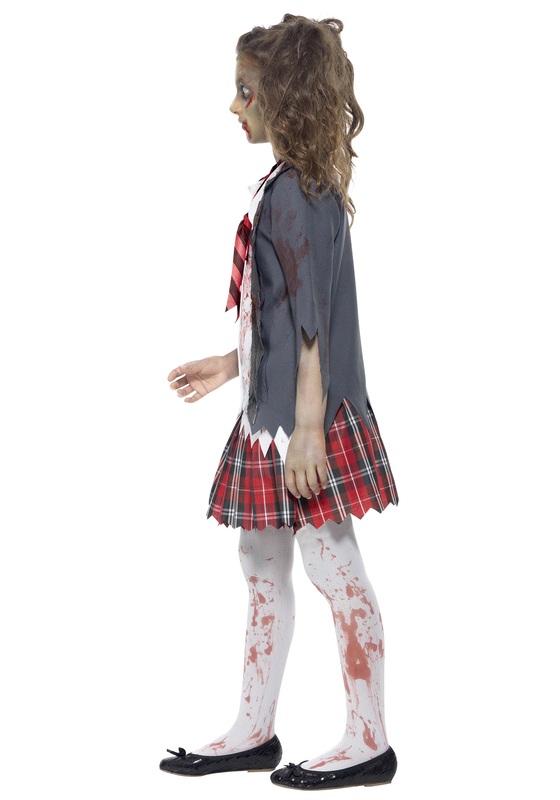 This outfit is a classic school girl uniform style, but with tattered hems and fake blood splattered all over it, to give it a lovely zombiefied twist. You'll definitely want to get her some gross zombie makeup to complete this look!